If you’ve created a Google Doc with a lot of different sections, it’s a good idea to help readers navigate through it easily. One way to do this is to insert hyperlinks to different sections. You can insert a hyperlink to either a heading in the document, or a custom bookmark that you have added. 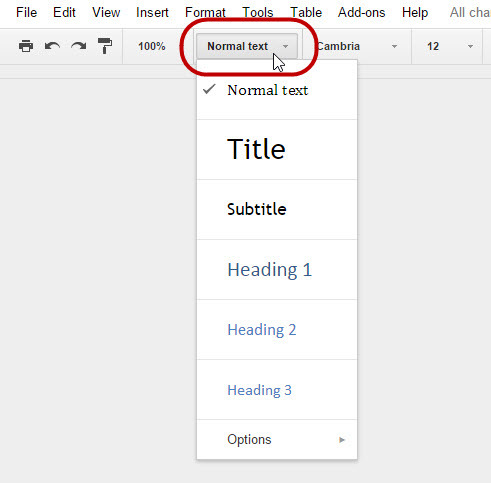 Google Docs have a pre-existing set of text styles that provide consistent formatting in your document. You can find them on the formatting toolbar, usually behind the Normal text button. 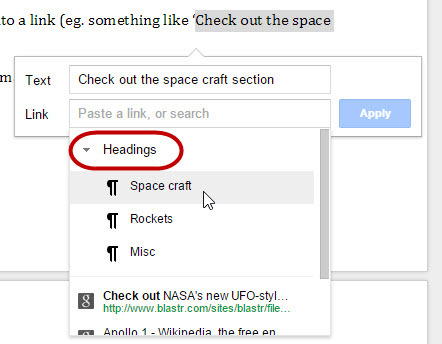 Each time you use the Heading 1, 2, 3 or 4 style, Google Docs recognises the heading as a new section in your document. This allows you to easily hyperlink to that section by following the steps below. 1. Highlight the text you want to turn into a link (eg. something like ‘Check out the space craft section for more information’). 2. Click the Insert link button in the formatting toolbar. 3. Select Headings from the link section. 4. Select the heading you want to link to. 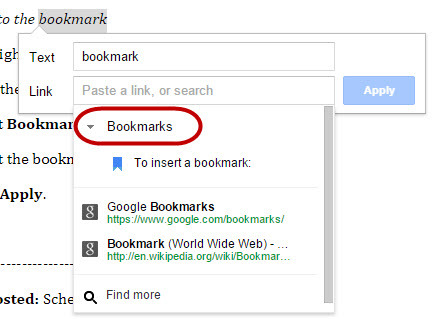 Bookmarks can be placed anywhere in a Google Doc. They are very useful if you want to link to a specific line of text, or anywhere that is not a section heading. 1. Put your cursor at the location you want to insert the bookmark. 2. Click the Insert menu > Bookmark. 3. A bookmark will be added to the location. 1. Highlight the text you want to turn into a link. 3. Select Bookmarks from the link section. 4. Select the bookmark you want to link to. Tip: Each bookmark has its own URL. This can be given to other people and used to take them immediately to the right place in a document. 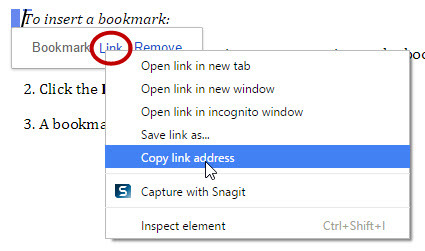 To find the URL for a bookmark, click the bookmark, then right-click the word Link. Select Copy link address from the menu (this assumes you’re using Google Chrome – the menu item may be different for other browsers). Posted in Google, Google Docs, How do I?